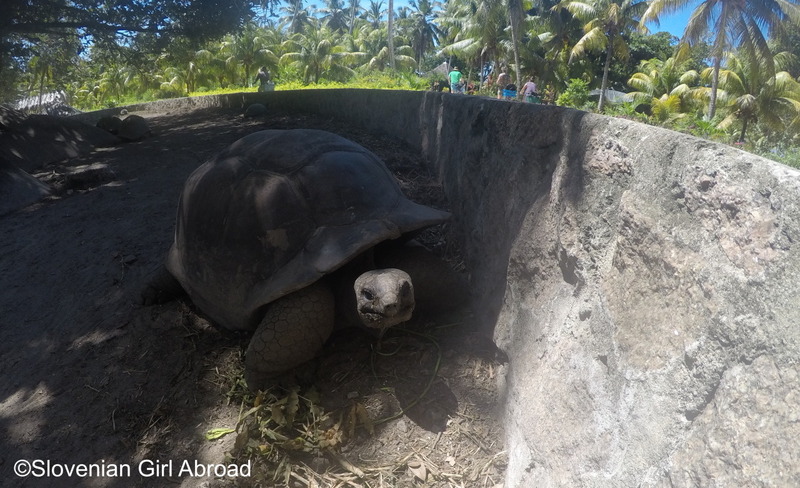 14 days in Seychelles were enough to see and experience many things this tropical paradise has to offer: we swam and snorkelled at some of the most beautiful beaches in the world, we saw countless number of colourful fishes, we swam with the turtles, we hiked, we cycled, we pet giant tortoises, we’ve visited the prehistoric tropical forrest, etc. We travelled from Zürich airport to Seychelles with Turkish Airlines via Istanbul. We arrived to Seychelles in early hours of the next day. For the first two days we’ve stayed at the largest island of the Seychelles archipelago – at Mahe. After we’ve arrived to our hotel at the west coast of the island, we spent the rest of the day resting and relaxing at the beautiful Anse Barbarons (Barbarons Beach). 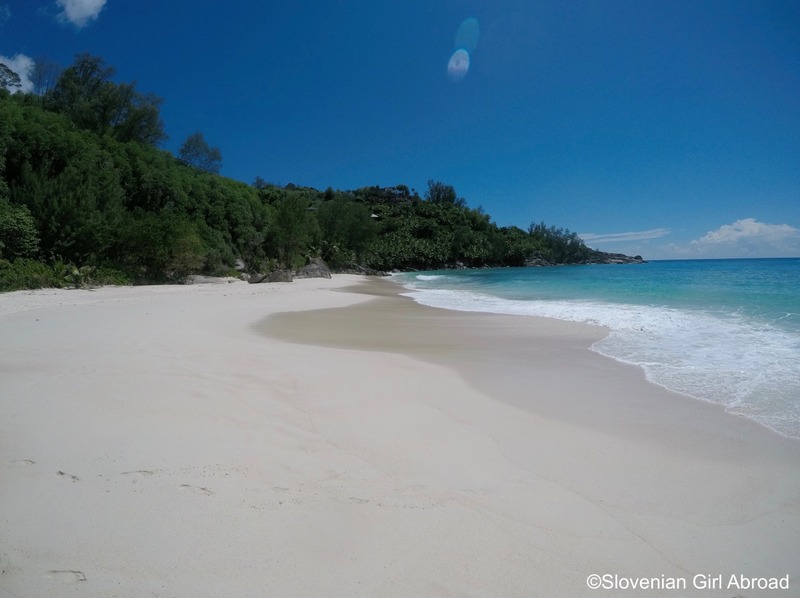 Second day at Seychelles was similar to the first one – dedicated to relaxation at the beach. We’ve spent the morning swimming, snorkelling, and relaxing at Anse Barbarons. In the afternoon we left our hotel and went exploring. We walked to the beach Grand Anse where we’d chilled for a bit before we returned back to our hotel and spend the rest of the day at Anse Barbarons. After a quick jump into the ocean at Anse Barbarons in the morning, it was time to pack the bags and leave this lovely place. We checked out of our hotel and took a taxi to the capital of Seychelles Victoria. At its port we caught the ferry to La Digue – the third largest inhabited island of the Seychelles. After we arrived to the port of La Digue, we were greeted by the owner of our accomodation who took us to the guesthouse where we’ve spent next four nights. 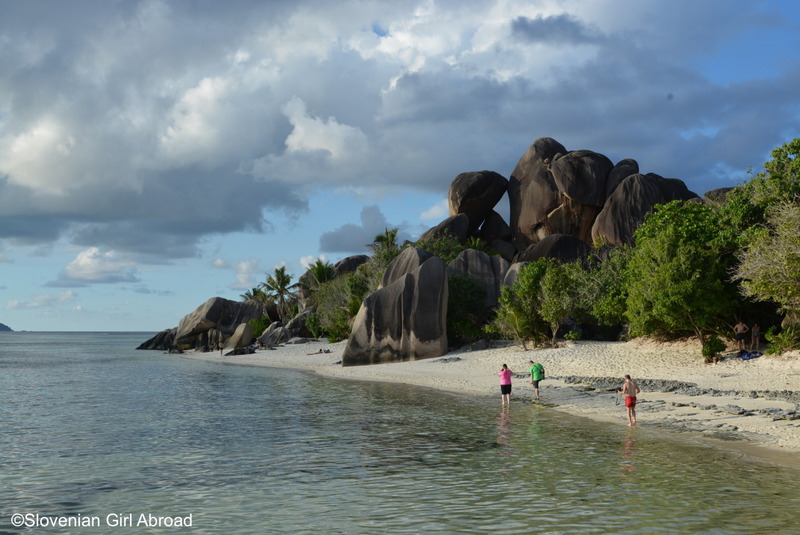 On our first morning at La Digue, we’ve rented bikes and we went exploring the island. 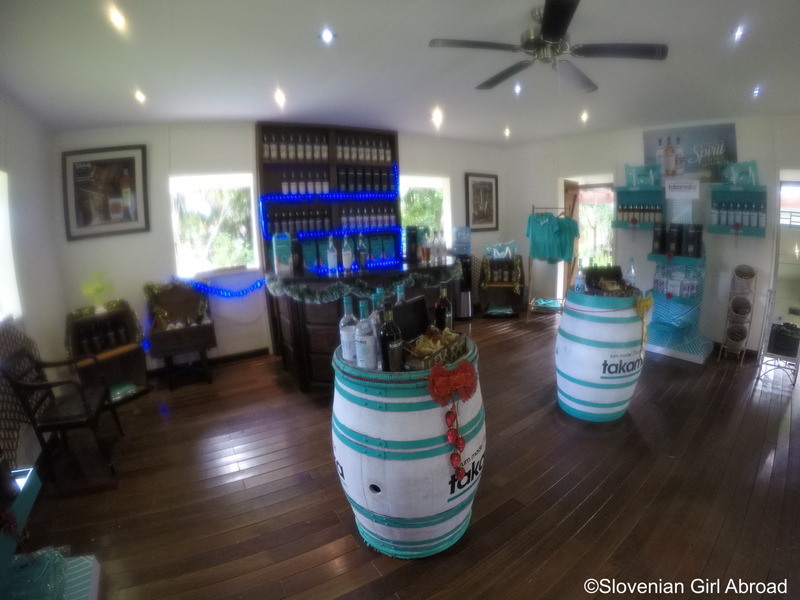 Our first stop was L’Union Estate – a former coconut plantation now turned to tourist attraction. 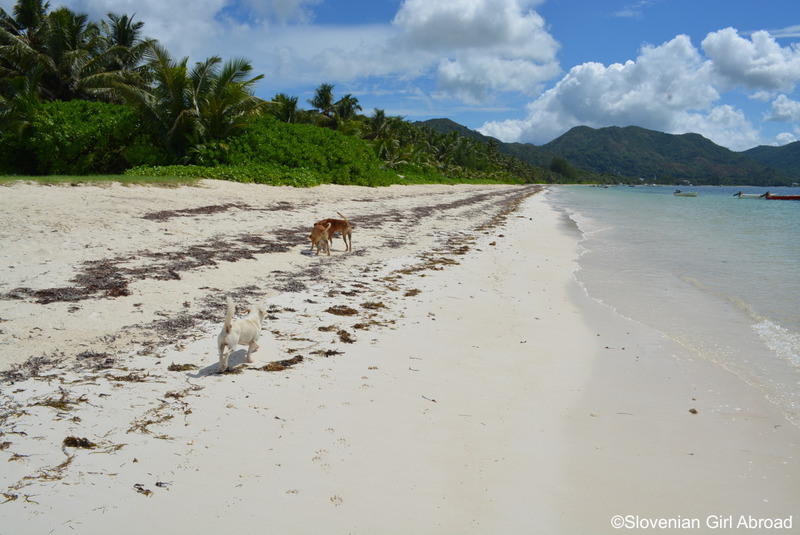 We’ve explored the estate before we went to the famous beach Anse Source D’Argent. There, we found our spot in the shade of the palm trees and enjoy the scenic beauty of this place. After few hours we left and went exploring the rest of the island. 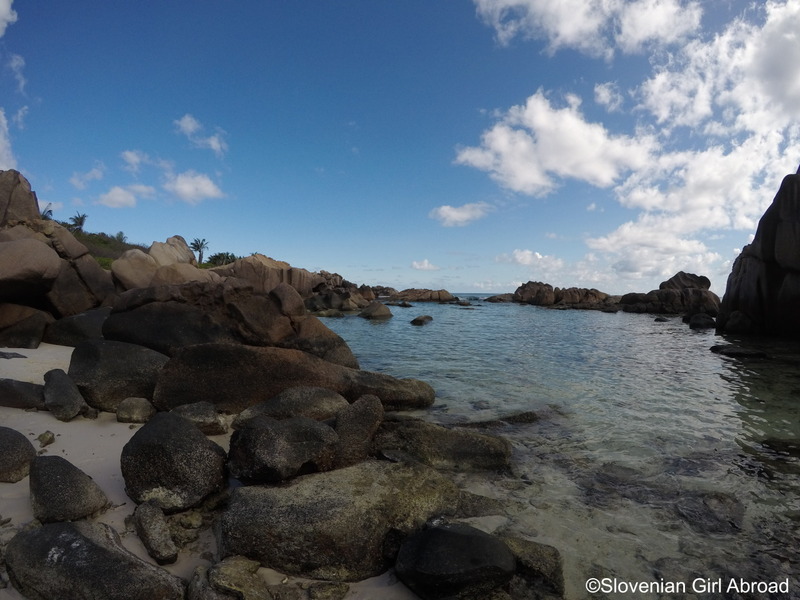 We cycled to beaches Anse Severe and Anse Patates where we made a short stop for snorkelling. Then we continued our cycling tour following the scenic road past the beautiful beaches Anse Gaulettes, Anse Grosse Roche, Anse Banane all the way to Anse Fourmis where the road ended. We returned back to our guest-house the same way. On the sixth day of our trip, I turned 30. I decided to spend my birthday at the beautiful beach Anse Cocos. To get there we had to cycle to the beach Grand Anse. There we’ve parked our bikes and hiked to Anse Cosos via beach Petit Anse. We’ve spent our day at Anse Cocos swimming and relaxing. In the afternoon we hiked the same path back to the Grand Anse, picked up our bikes and cycled back to our guesthouse. After we’ve talked to our families via Skype, we went for a Birthday dinner to the Italian restaurant nearby. The seventh day of our trip was to me the best day of our trip to Seychelles. 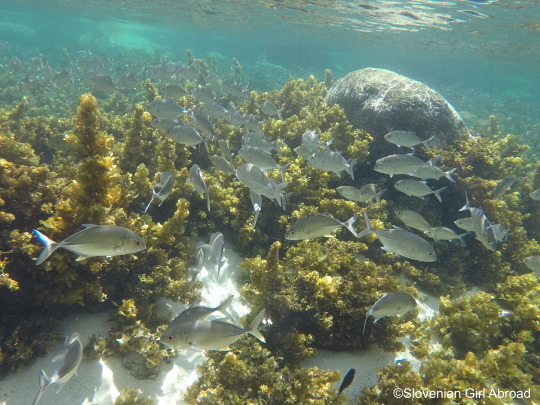 We went on a snorkelling trip to Grande Soeur (aka. Big Sister Island) and Félicité islands. 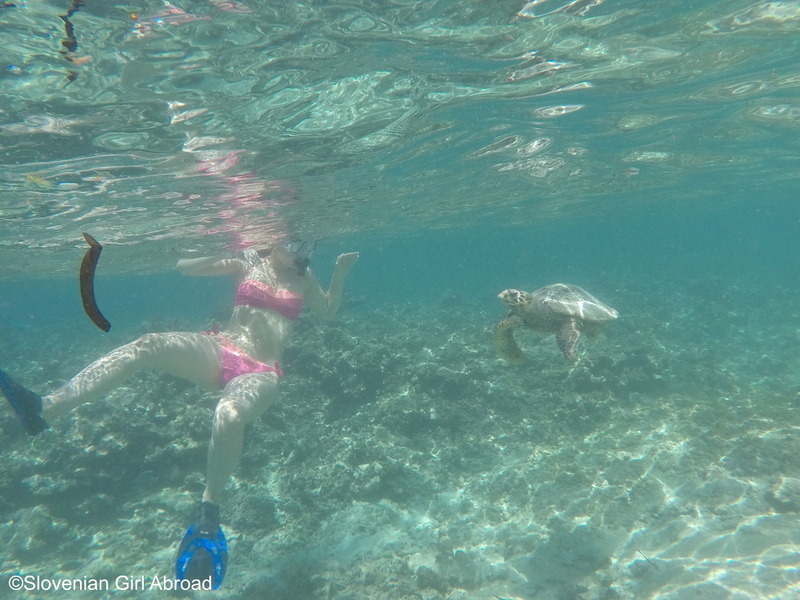 We didn’t only see plenty of colourful fishes and corals, but we also swam with the turtles! After we returned back to La Digue, we went to the Anse Source D’Argent where we saw the most beautiful sunset I’ve ever witnessed. 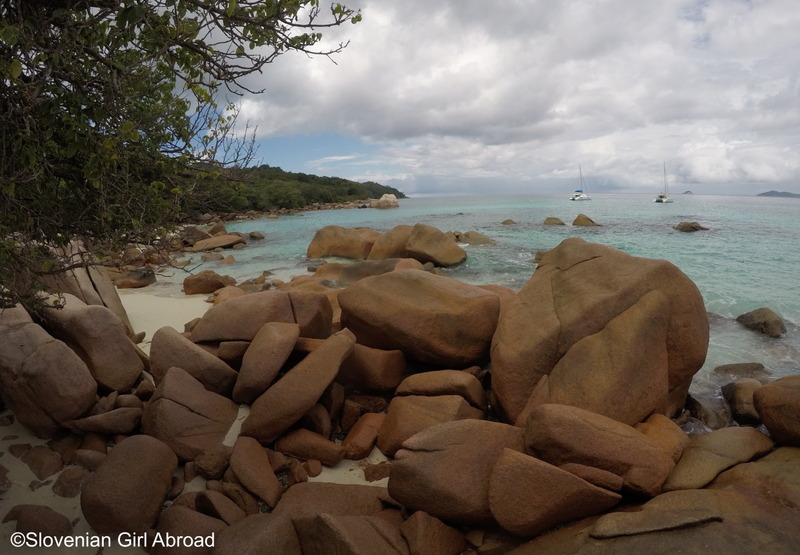 On our last day on La Digue we went hiking to the top of La Digue – Nid d’Aigle. 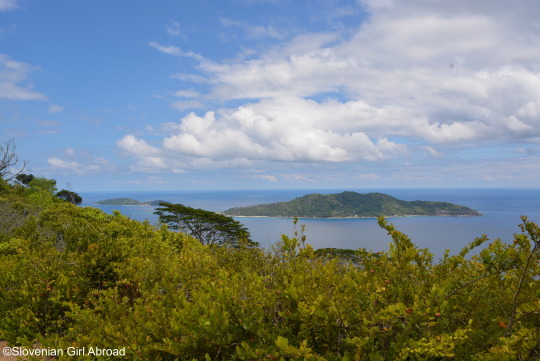 After hike, we returned to our guesthouse, took a our luggage and then we caught our ferry to the island of Praslin – the second largest island of the Seychelles. After we’ve checked-in to our hotel, we went for a long walk on the beach Grand Anse. 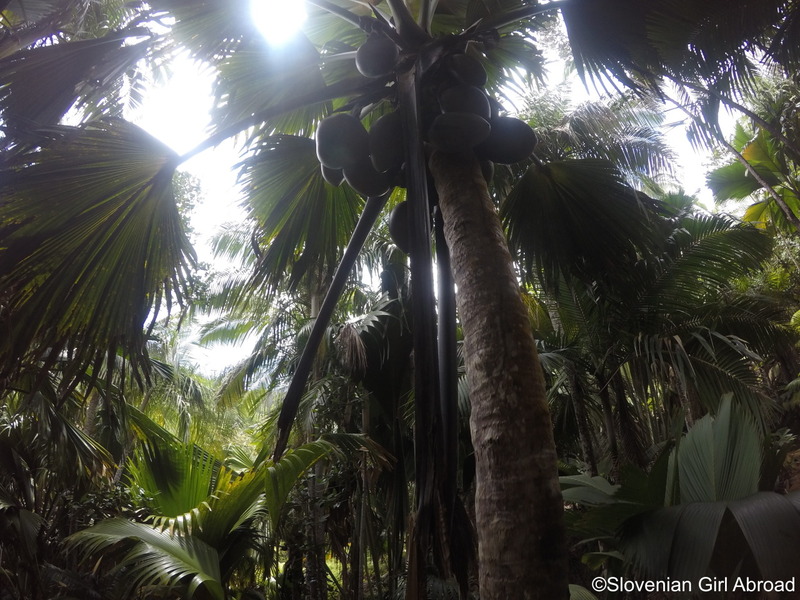 On the ninth day on Seychelles, we went to visit Vallée de Mai, Seychelles’ UNESCO World Heritage site well-known for its well preserved palm forrest – the only place where unique Coco de Mer palms can be found. After a stroll through the “Garden of Eden”, we returned back to our hotel and spent the rest of the day relaxing at the Grand Anse beach. 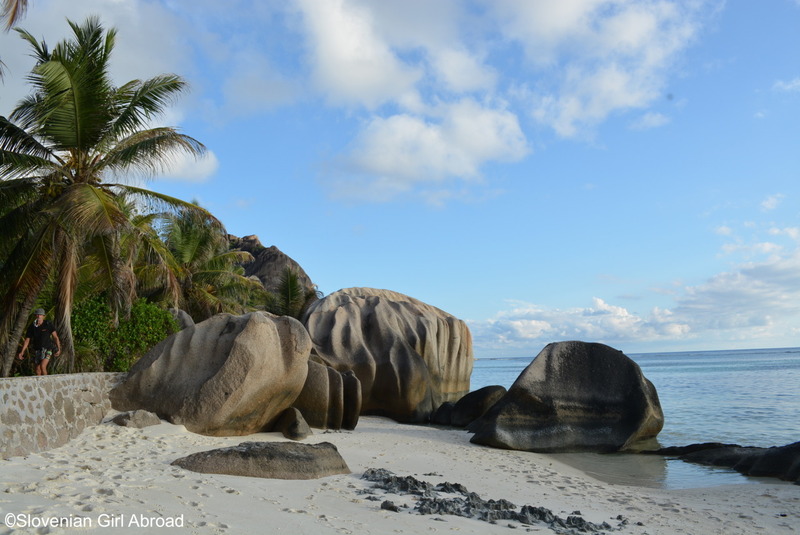 Tenth day was the day we went to visit famous beach Anse Lazio. Unfortunately, the weather turned bad that day – the sky was covered with tick layer of clouds and few times during the day it started to rain. But that didn’t ruin our day. We still had a lot of fun swimming and snorkelling. In the afternoon, we returned back to Grand Anse via scenic eastern road. The gloomy weather didn’t last long. In the morning sun came out and we decided to visit another beautiful beach called Anse Georgette. Our hotel kindly made all the arrangement with the Lemuria resort and we were able to walk through the hotel grounds to the beach where we’d spend the day enjoying the sun and the ocean. Our time at Praslin island had come to an end. After the last morning stroll along lovely Grand Anse, we left our hotel and took the ferry back to island of Mahe. Our basis for the next two days was Anse Royale at the East coast of the island. After we’ve checked-in to our apartment, we went to nearby Anse Parnel where we spent the rest of the day at the beach. 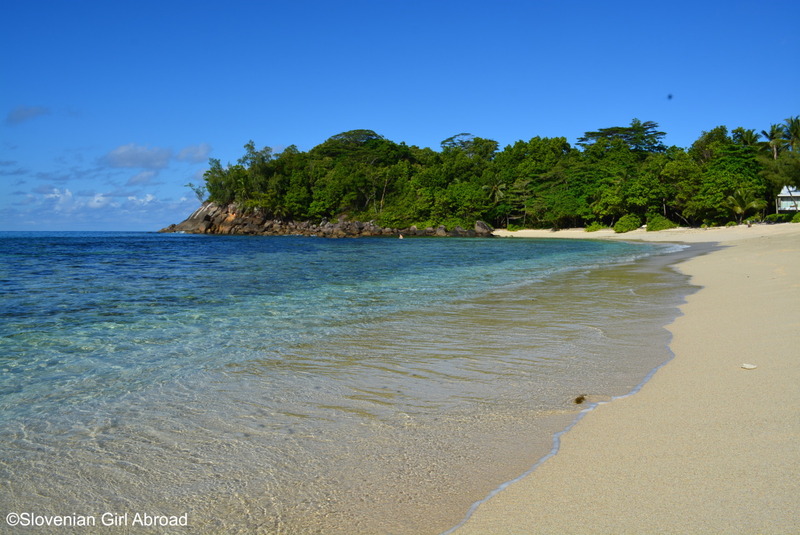 On the thirteenth day of our trip we drove to the capital of Seychelles Victoria. We strolled around the town and visited all the main attractions. After we did the last souvenir-shopping, we hit the road and drove the scenic road via San Soucis to the west side of the island, then we followed the road in direction of South. We stopped at the stunningly beautiful beach Anse Intendance for a swim in a clear turquoise water. Refreshened, we drove back to the East coast, to the Takamaka Rum Distilery where we’ve sampled the delicious rum that is produced there. Then we drove back to the Anse Parnel and spend the afternoon there. Soon it was time to return back to our apartment where we’ve spent our last evening packing. Because our flight to Europe was scheduled at 7am, we had to wake up very early in the morning. While driving to to the airport, we’ve witnessed the most amazing sunset. It was a great farewell from this tropical paradise. With slight delay, we’ve boarded the plane and flew back to Europe. So so beautiful! Congrats on spending your birthday in such a beautiful place. Love your photos! Oh yes, I think it was the best place to celebrate my birthday. 🙂 Thank you! Isn’t that giant tortoise just beautiful. oh wow! what a birthday trip! Beautiful photos! I hope that you had a happy birthday! I most certainly did. Thank you! Wow what a gorgeous place! 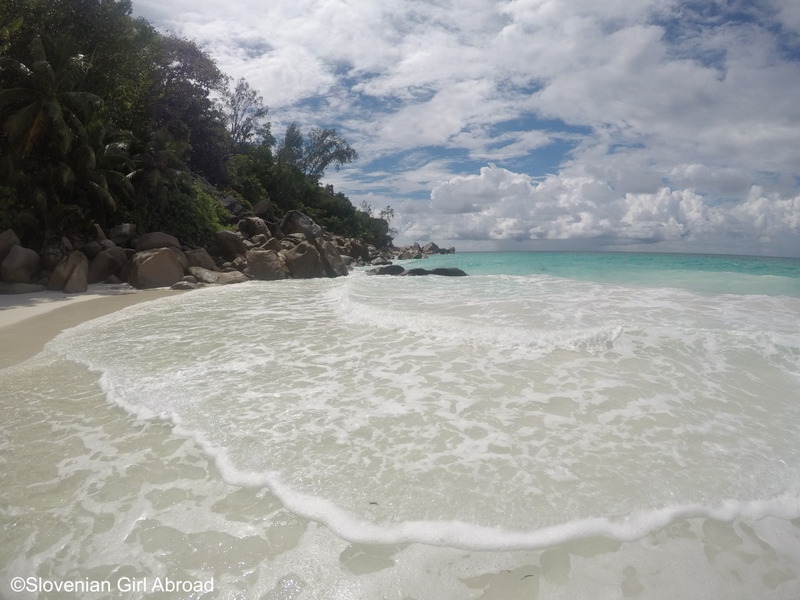 I would love love love to visit the Seychelles one day, an absolute dream destination! What a wonderful birthday gift to yourself! Your pictures are gorgeous! So beautiful! Especially that clear water which looks particularly tempting in the heat I am currently experiencing here in Santiago. And yes, I can definitely relate to those holidays where you get home and want to head their again, straight away. WOW!! You got to swim with turtles!! That’s so cool!!!!! I love the natural scenery of the place…. I’d love to visit!! What a fantastically special way to spend your birthday, especially for two weeks!! I went there for my honeymoon, a completely unconventional one and loved every bit of it. Unfortunately we only had 4 days so couldn’t explore much, but man this place is heaven. So glad you could visit so many islands! Anse Source D’Argent is definitely one of the most beautiful beaches I have ever seen. It’s not perfect for swimming though. I’ve been hearing so much about Seychelles and it seems like one of the top tropical spots in the world – and ohhh man, two weeks there seems like a perfect vacation! Glad you had such a fun time. I would love to go and hopefully one day I will, but the distance does put me off a little bit. Then again, the Caribbean (my preferred tropical locale) isn’t so close to everything either, so (shrug). Oh this looks heavenly! I would love to visit the Seychelles. 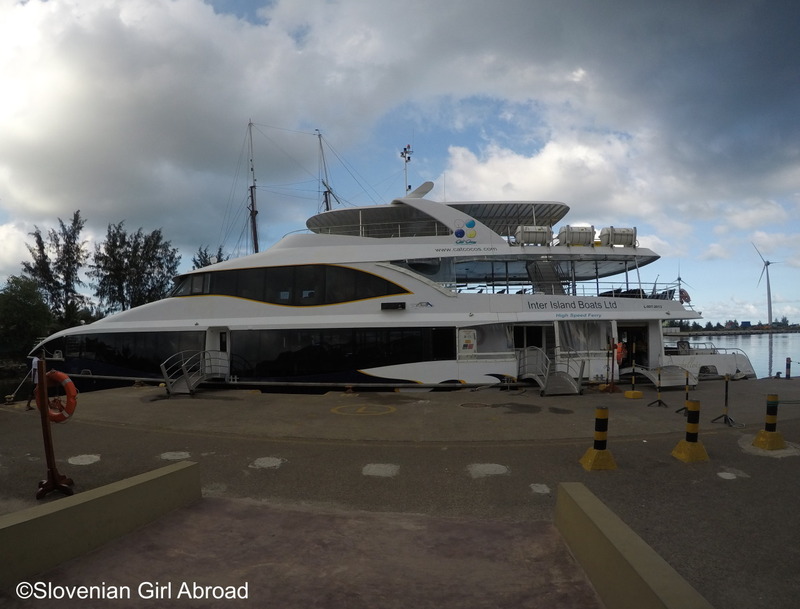 Especially for the snorkelling and scuba diving – it sounds like my kind of adventure! Those beaches look fabulous. I miss sipping on fresh coconuts each day when I lived in Fiji. Lovely photos. Wow, that sounds like such a dream trip!! While I live on Mahe my husband and I spent our first of many weekend trips together on LaDigue in Dec ’16. What a small world to think we may have passed by you two on our bicycles! We stayed at LeRepaire which I’m guessing is the Italian restaurant you are referring to. LaDigue is definitely magical! Thank you, glad you liked them. Where are you from? Everyone says how beautiful it is in the Seychelles, but to actually be there must be something else! I can imagine how gorgeous that sunset must be. And swimming with sea turtles! Love. Gorgeous! What a lovely place to spend your birthday. I would love to visit the Seychelles, that water just looks amazing. Thanks for sharing on #TheWeeklyPostcard. I guess like I’ve seen in the photos, beach, beach, beach 😉 Glad there are more substance to it though!